Click here for helpful online resources. This approximately hour-long webinar explains the new Model Internal Survey Program. If you’re looking for sample policies, procedures, and the TVIB process for conducting an internal survey, you’ll find it here. 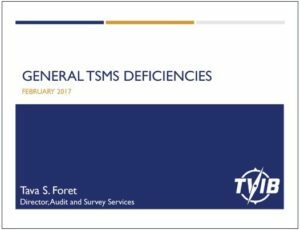 TVIB has approved this program as a Subchapter M compliant sample for TPO customers who have opted to use the internal survey option for compliance. as presented at the GNOBFA – Subchapter M Forum 02/02/2017 in Kenner, LA and at the Inland Waterways Conference 03/07/2017 in Cincinnati, OH. Click the image above to download the presentation.